At Westmark we believe that everyone can prepare food themselves and they should be able to do it as simply and easily as possible. That is why we manufacture the most functional kitchen tools for daily use! For traditional reasons, We produce most of their products in Elspe, Germany. The better way to dry your leafy greens and vegetables. The Fortuna is made in Germany from the highest quality materials. 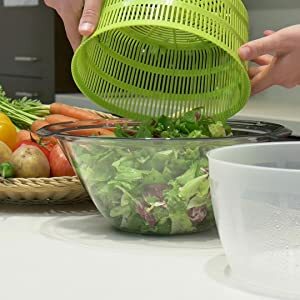 Our Salad spinner efficiently dries lettuce for a salad, so it wont water down your dressings. It has a 5 liter capacity. 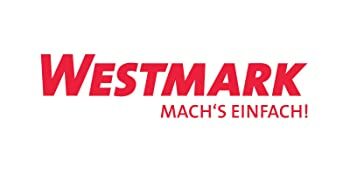 The Westmark spinner has our easy spin, solid, reliable mechanism, no new fangled buttons or gizmos that break easily. The hand crank is sturdy and easy to operate. Easy to turn spin knob washes and spins dry Lettuce and Leafy greens for salads, as well as fruits and vegetables. 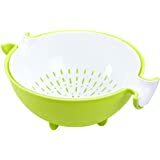 You can also remove the basket to be used as a colander. The lid comes apart for more thorough cleaning. The Westmark Salad Spinner does exactly what you'd expect. It seems just as well built as it's OXO counterpart but for half the price. To my way of thinking, whirling your hand around a couple times is just as easy as pushing a big button a couple of times, though maybe not quite as elegant. The spinner action has a nice, smooth and weighty feel to it. In other words, you don't feel like you're about to break it by giving it a good spin. Also, when spinning with your dominant hand, there is a nice ergonomic divit on the opposite side to hold with your non-dominant hand...a good thing, or you'd quickly have salad all over your floor. This product is intelligently designed so that either left or right handed individuals will find it just as easy to use. As with all my non-5 star reviews, there are a couple things I don't like, but they're minor. First, is the fact that the top doesn't easily dissemble for cleaning. 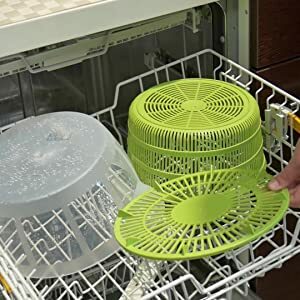 This leaves you somewhat awkwardly rinsing water through it but not able leave it in a position that would let it dry quickly. Second, is the fact that the little bit of documentation the comes with it doesn't clearly indicate whether or not its dishwasher safe. I eat lots of big salads. That's my favorite meal. This is my third salad spinner. First was Copco - the best by far, but discontinued. Then OXO. OXO never dried the greens as well as Copco, and the plunger mechanism of OXO took up lots of space in the basket leaving less room for greens. The speed of the OXO was not great enough to truly spin all the water out. It was good enough, but not great. The upside of it was that the extra greens seemed to store longer in the fridge than from the Copco. It finally broke. The two plastic parts of the plunger/lid came apart and insides fell out and when I put back together, it was not the same. Anyway, when looking for a new spinner, I wanted the hand crank type because I think it actually dries best. The Westmark was highly rated and the size seemed good so I bought it. This is where the 4 vs 5 star comes in. At the time of my purchase, they had 3 options; one for $13.99 and two for $16.99. I bought the more expensive one because I mistakenly thought it would be the model with the non-skid feet that reviews mentioned. I ordered the green model that shows feet in the picture on this website. I did not get feet. 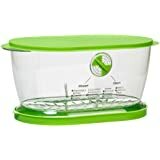 There is a piece of product information that comes shrink wrapped with the Westmark Salad Spinner. That showed a picture of the model with feet in red and not green, even though the actual product it was shrink wrapped to did not have the feet and was green. For those who don't know, the non-skid aspect of a salad spinner is important so that it does not fall off the counter when you let go after cranking and it is still spinning. It's a very helpful feature. I wish mine had it. Since I posted a question about what the difference between the $13.99 and $16.99 models is, the seller changed the pricing and they are all $16.99 now. I think it's a supplier/manufacturer problem. My guess is that they don't make the model with the feet at all any more and just haven't changed the pictures. In any case, it's not that big a deal to hold onto the spinner until it stops. But that's why 4 and not 5 stars. The basket is only slightly smaller than the OXO, but has more capacity since it doesn't have the plunger in it. It's also flimsier, but that shouldn't matter too much. It's more compact and stores better than the OXO too. I like that. It spins very fast and gets out more water than OXO. I usually spin in one direction, then the other, then re-position greens, empty water and spin again. It works great. The holes in the basket are about the same size as OXO, but more greens go through the Westmark basket than in the OXO. I guess that's a function of how well it works. I would not recommend breaking or cutting greens before spinning for that reason. Wash, spin and then break/cut for salad. Some smaller greens, like baby arugula, generally stay in the basket, but a few get through. No big deal. I pick them out add them to the mix to spin again. I've only had the Westmark for a week, but am very pleased with it. The only complaint is that it does slip on my counter and I have to be more patient and hold onto it. 5.0 out of 5 starsDoes the Job Perfectly and With Ease! I'm a vegan, so eating my veggies isn't a casual kind of thing for me. 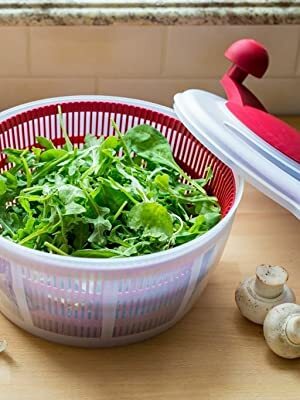 I needed a vegetable spinner to help ensure that any undesirable residues were removed, and that I was able to easily remove excess moisture when I need to do things like roast kale chips. In looking for a spinner I went through way too many product reviews to the point where I had no clue what to try. 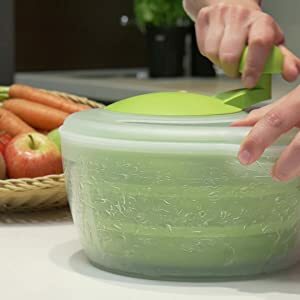 I have a friend with the Oxo spinner but was turned off by finding out that the plastic top discolored and eventually degraded leaving small amounts of plastic on her veggies. And I was unimpressed by what I'd seen in the stores as they seemed either way to small to be effective or were awkward to use. 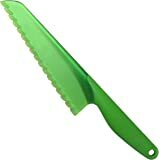 And frankly I was hoping to get one in something other than the green that every manufacturer seems to think is best for cutting boards and such. So I started looking on Amazon. After looking at a bunch of models from several manufacturers I decided to give this one a try. In short, I love it! 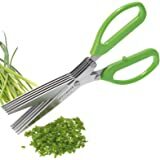 This is so easy to use - toss in the wet veggies, turn the handle a couple times and it is quickly done. 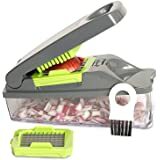 The lid does snap on in firmly in place, and the mechanism is very smooth and easy to get up to the speed necessary to remove both liquid and small solids. I had no problems with holding it in place while turning th handl, and had to apply only a very minimal amount of pressure to keep the spinner in place. And loved that it was also available in red! I think that the best indication of how good this performs is in the actual results: I filled it with some "organic triple rinsed" kale, turned the handle three times and then waited for the spinner to stop; after removing the kale that tripple washed kale had left a visible amount of dirty gritty residue on the bowl. Yuk! Now I know my kale is clean! 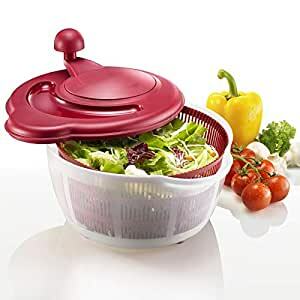 This to me is the best value for a salad spinner anywhere, and I would say that it makes this vegan very happy! 5.0 out of 5 starsBest one on market. Great price! Can't go wrong. This is an excellent product. It's unbelievable the amount of moisture that is released. My lettuce lasts much longer, especially if I store it in a ziplock with a paper towel in it to absorb any remaining moisture after I spin it. 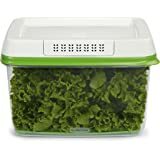 This little trick keeps my lettuce fresh and clean for salads for up to 3-4 weeks!